Chuck, I shot my buddies today actually. Love the feel of the gun, but I agree on trigger. Untenable and really left me heartbroken. Not the worst I have felt, but dampened my fervor. flyingirish04 wrote: Chuck, I shot my buddies today actually. Love the feel of the gun, but I agree on trigger. Untenable and really left me heartbroken. Not the worst I have felt, but dampened my fervor. I like the look of that thing with a suppressor. Wish I could handle/try one out. I'm going to do the water test with mine, however... I think I'm gonna skip the mud and sand experiment. I'm just not that brave. Last edited by Ditch on 04 May 2013, 05:58, edited 2 times in total. The trigger isn't the greatest. My biggest complaint with my M4-2000 suppressor is the blowback. I might try shooting it with my SDN-6 and see if it eases up a bit. It is a lot of fun and a well designed, easy to hold weapon. I handled the tavor yesterday at the convention, its very heavy and to me, a little akward. My local LGS has 16B in stock for 2100 I dislike paying over msrp on guns maybe in few months I will be able to pick one up at or below msrp. It did fill a little hevy to me also. I paid just under MSRP for my flat top & the IDF version I have on preorder was $200 < MSRP. If you forget GB and look around, you can find them without the insane markups. You probably will pay MSRP though. Once I started shooting this gun I just couldn't stop! I did accuracy testing with different rounds, also... IWI claims that the Tavor is Over-the-Beach capable and I wanted to see if that was true. Did it function properly after being completely submerged or did it result in a kaboom/trip to the ER? I will say that this gun's ergonomics are incredible and on top of that, if you have a bunch-o-5.56 rounds to play with... this has got to be the most fun I have had shooting in a loooong time. The only downside is the trigger. While it doesn't have the typical bullpup mushiness; it actually has a very clean break, it's fracking HEAVY. I mean heavy to the point where, during the accuracy testing, I literally had to stop to see if the safety was on. It did lighten up about four pounds (yes, 4lbs!) after several hundred rounds, but it's still incredibly distracting & tiring if you're shooting a lot of rounds. I am now going in search for a gunsmith who is competent/willing to work on this newly released gun and I will keep you all posted if anything changes. did you or will you run steel case ammo? just wondering. Ditch wrote: did you or will you run steel case ammo? just wondering. I did not and I probably won't. I think Sturmgewehre on youtube has a video where he did that with a Tavor. 2) There's a second spring used to make the trigger reset more positive that can be removed. When I did that, the pull went down to 7.5lbs. It was a very noticeable change. 3) Next up will be some polishing, and I figure that should be good for shaving off some additional weight. I'll do that after my next range outing which will be next Monday. 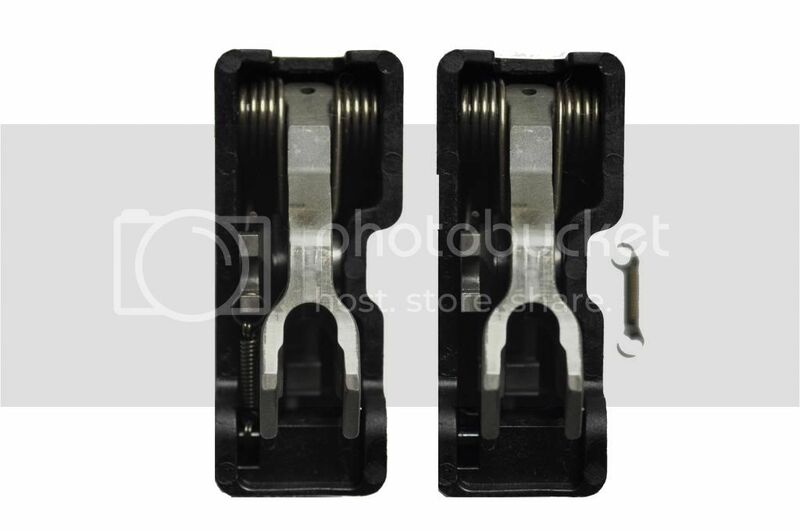 Here is the trigger pack with the reset spring (left) and without (right). It's just held in with a roll pin. Polishing up trigger parts is beyond my knowledge level, but I bet for $50 or so Bill Springfield would do it. I am going to try removing that spring and retesting the draw weight - that is a big 'wow'. The Tavor with half the trigger pull weight would be fantastic. Just sent Bill some picks and info to see what he has to say. I don't know a better person to ask to smooth out and lighten a trigger. More accuracy shooting and a mod to reduce the trigger pull weight. "If I can do it" LMFAO he could can and will long after most of us are in the ground.